Are you a seasoned system administrator charged with setting up an Oracle database? Or did you suddenly become a DBA by default? 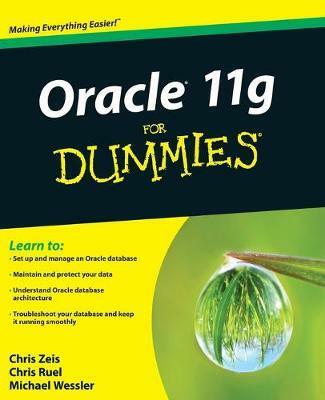 If database administration with Oracle is part of your job, you'll be glad to have Oracle 11g For Dummies in your cubicle. This nuts-and-bolts guide walks you through the mysteries of Oracle and database administration. You'll learn how to understand Oracle database architecture, set up and manage an Oracle database, and keep it running in tiptop form. Oracle 11g For Dummies covers: The building blocks behind the database engine as well as Oracle's physical and logical structures Hardware, software, system, and storage requirements for implementation How to recognize and accommodate the differences between Oracle installations on Windows and on Linux/UNIX Daily and intermittent tasks necessary to keep your database running properly How to assess potential threats to your database, configure Oracle Recovery Manager, and set up backup and recovery procedures When to use online, offline, controlfile, and archivelog backups Troubleshooting methodology and how to use Oracle database logs and other diagnostic utilities Different ways to manage your database How to automate jobs with the Oracle Scheduler Using SQL in Oracle, and a great deal more Completely up to date for the newest release of Oracle, Oracle 11g For Dummies will give you both the information and the confidence to set up and maintain an Oracle database for your organization. Grow wise about Oracle and get going with the leading database software! Introduction. Part I: You Don't Have to Go to Delphi to Know Oracle. Chapter 1: A Pragmatic Introduction to Oracle. Chapter 2: Understanding Oracle Database Architecture. Chapter 3: Preparing to Implement Oracle in the Real World. Part II: Implementing Oracle on Your Own. Chapter 4: Creating an Oracle Database. Chapter 5: Connecting to and Using an Oracle Database. Chapter 6: Speaking the SQL Language. Chapter 7: Populating the Database. Part III: Caring for an Oracle Database. Chapter 8: Protecting Your Oracle Database. Chapter 9: Protecting Your Oracle Data. Chapter 10: Keeping the Database Running. Chapter 11: Tuning an Oracle Database. Chapter 12: Troubleshooting an Oracle Database. Chapter 13: Monitoring and Managing with Enterprise Manager. Part IV: Inspecting Advanced Oracle Technologies. Chapter 14: Flashing Back and Replaying: Advanced Features. Chapter 15: Using High-Availability Options. Part V: The Part of Tens. Chapter 16: Top Ten Oracle Installation Do's. Chapter 17: Top Ten Database Design Do's. Appendix A: Quick Start Install of Oracle 11g on Linux. Index. Chris Zeis is Chief Technology Officer and partner at Perpetual Technologies, Inc., an Oracle partner. Chris Ruel is an Oracle database administrator and consultant. Michael Wessler manages multiple Web applications for the Department of Defense and consults at various government and private agencies.